The most important ingredient in turmeric is curcumin, which is found within the root of the plant, and it is this part which is responsible for its bright yellow colour. The highly concentrated extract of turmeric roots used in these tablets is 95% curcumin, which means that each tablet provides the equivalent of 10g of culinary turmeric (or two heaped teaspoons). The tablets are taste free and coated for ease of swallowing. 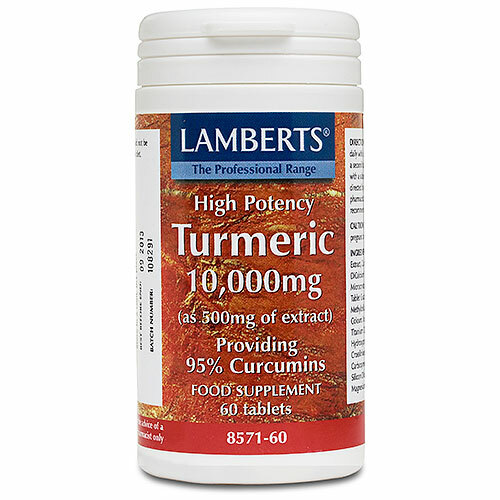 (as 500mg of turmeric root extract) providing 95% curcumins. Tumeric Root Extract, Calcium Carbonate, DiCalcium Phosphate, Microcrystalline Cellulose, Tablet Coating (Hydroxypropyl Methylcellulose, Glycerine Colours: Iron Oxides & Titanium Dioxide) Hydroxypropyl Methylcellulose. Crosslinked Sodium Carboxymethylcellulose, Silicon Dioxide, Stearic Acid, Magnesium Stearate. Take 1 tablet daily with a meal. If necessary, a second tablet can be taken with a subsequent meal or as directed by a practitioner or pharmacist. 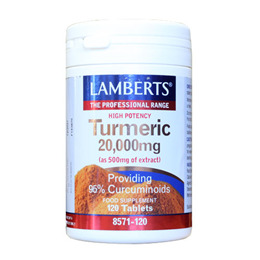 Below are reviews of LAMBERTS Turmeric - 120 x 10,000mg Tablets by bodykind customers. If you have tried this product we'd love to hear what you think so please leave a review. An excellent product: it’s not the first time I’ve bought it and won’t be the last. Bought for my partner who has myeloma as had read this has beneficial effects on blood. His last set of readings after taking the first batch of turmeric had improved so I have high hopes that this product is helping. I have been using this product for years and always recommend to friends and family suffering with inflammation. I survived advanced undiagnosed familial polyposis which resulted in total colectomy and I have had no polyp regrowth since I have been taking this this high strength formula which is exceptional value for money. Please be aware that this product must be taken in conjunction with a food substance that has a natural oil base as well as black pepper to maximise effectiveness.I would consider low strength turmeric capsules a waste of money if you wish to benefit from curcumin's well documented anti bacterial, fungal and cancer properties. My GP recommended Turmeric for my fibromyalgia pain. I tend to be sceptical of herbal medicines, but I tried this, and it has made a huge difference to me, particularly by lessening muscle cramps. I don't think a brand with a lesser amount of Turmeric would have the same effect, so I am willing to spend the money for this.